Flowering Quince (Chaenomeles speciosa) close up view. “Spring” … sprung or unsprung? In the middle of what is supposed to be winter, when the days are still relatively short and the nights long, the plants in the Glencarlyn Library Community Garden are responding to the record-breaking high temperatures with a confusing but wonderful mix of blooms, berries, textures, and colors. Never before have we seen such combinations of winter and spring in the Garden. Here are some photos taken on February 21 that made me smile and shake my head and look in wonder. Enjoy this quixotic winter/spring concoction. Take in the present moments in this post, at the Glencarlyn Library Demonstration Garden in Arlington, Virginia or right around you, for who knows what tomorrow will bring! Click on any picture to enlarge and see full descriptive captions. Bright purple Crocuses springing forth. Winter-long drooping ‘catkins’ on Harry Lauder’s Walking Stick (Corylus avellana ‘Contorta’) are actually its male flowers. Located in our Asian Garden, this Japanese camellia (Camellia japonica), delightfully named ‘Spring’s Promise,’ has for the first time ever produced three about to bloom flower buds. Native shrub Red Chokeberry (Aronia arbutifolia) is still sporting her winter berries, but the berries are now surrounded by spring’s new green leaves. 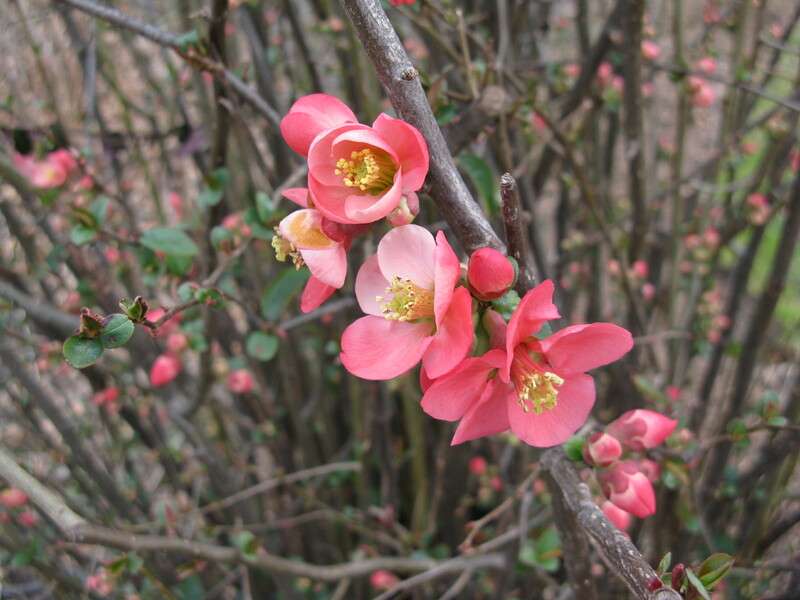 Flowering Quince (Chaenomeles speciosa) usually blooms winter into spring. Here this Chinese shrub is showing off its gorgeous coral blossoms all along leafless grey stems, perfect for Asian style flower arrangements. In the Children’s Garden, the first daffodils bursting into full bloom were captured on film on February 21st. Two bent ones were cut to bring into the Library and be shared with patrons as a small arrangement. ‘Red Sprite’, the female Winterberry Holly (Ilex verticillata), is still holding onto her winter treasure trove of berries close to the parking lot library entrance. The stems of Red Twig Dogwood ‘Baileyi’ ( Cornus sericea) shine in morning light, showing off their charm as “winter interest” even as Snowdrops, Crocuses, and Daffodils are coming into full bloom. Forsythia usually blooms in late March, but here come her spring- beckoning bright yellow flowers in mid-February. Leatherleaf mahonia (Mahonia bealei) is a late winter bloomer, providing pollen and nectar for early native bees and an orange or black Question Mark butterfly. This entry was posted in Glencarlyn Library Community Garden and tagged Glencarlyn Community Library Garden, Purple Crocuses, spring, Witch Hazel 'Jelena' (Hamamelis x intermedia). Bookmark the permalink.